At home in the mountains. Like it's mountain-dwelling namesake, Revelate's Pika seatbag is hearty, compact and thrives in the mountains. The Pika is Revelate's new, "smaller" seat bag – ideal for minimalist adventure cycling or for use on mountain bikes with minimal tire clearance, for example a women's full-suspension 29er or a smaller road bike with minimal exposed seat post. There's nothing small about the Pika's cargo capacity though; the bag uses a roll-down opening to expand or compress – comfortably swallowing 6 to 12 liters of cargo. A removable internal compression strap helps to compress cargo to keep it tight and close-in and high-density foam stiffens the front and protects cargo from rattling against the seat and seatpost. 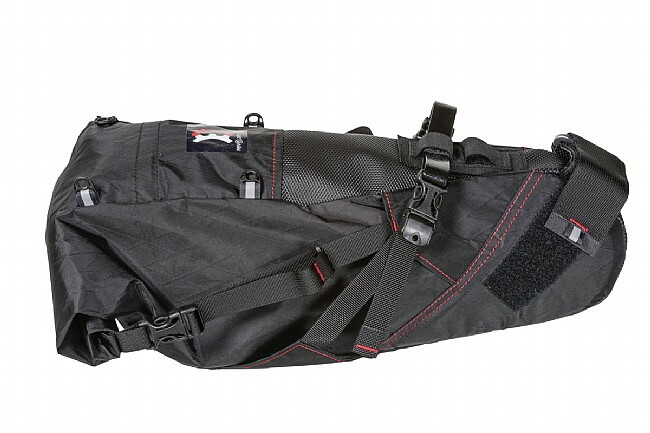 The bag attaches with a large velcro seatpost attachment and a dual-position saddle strap quickly and securely tightens cargo against the seat rails to minimize swinging. 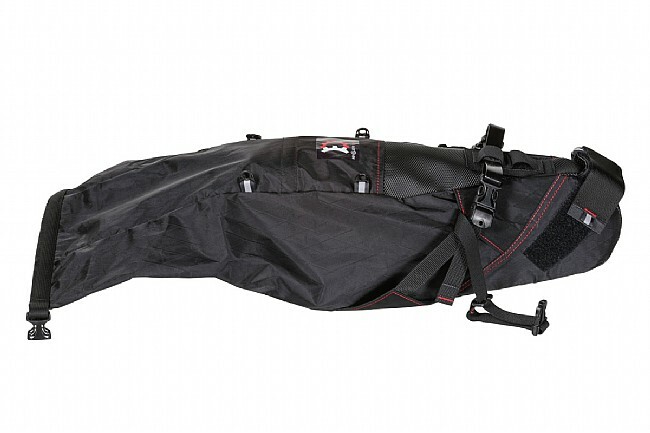 Revelate helped pioneer the modern soft bags used for off-road bike touring and bikepacking. Unlike the racks and panniers traditionally used for road touring, Revelate's modern soft bags are lighter, more secure on extreme off-road terrain and much more versatile – working on all your bikes, and easy to swap out. 12.6 oz. Volume: 6-12 L. Black with red stitching. Carbon seatpost-friendly. Dimension Polyant 200 denier Xpac laminate fabric with reinforcements. Coated webbing seat rail attachment. High density foam inserts & flexible plastic bottom sheet. Internal compression wings with removable strap 2" webbing anti-slip seat post attachment. 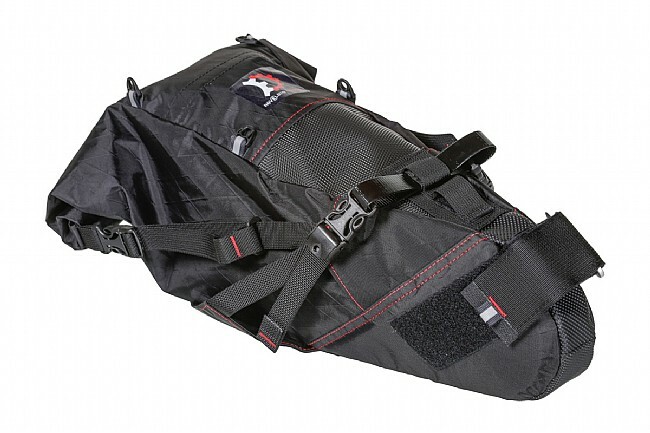 Sizing: Though the Pika is Revelate's “small” seatbag, it is still big. Please check your bike to confirm that you have the space. The Pika requires 6.5 in. of clearance from saddle rails to top of tire and a minimum of 3 in. of exposed seat post length. Fully compress full suspension frames to measure tire clearance. I ride a size small bike and use this primarily on my fat bike in the winter but have also used this on my road bike for randonneuring rides when you are riding long distances that are self-supported. The quality is great and after a couple of years use, I have not had any issues. I live in Anchorage, where Revelate was born and have many friends who use a lot of Revelate products on several different bikes. You will find Revelate products on bikes in the winter endurance races (ITI, Susitna 100 and White Mountains 100) as well as locals using them on their bikes all over the world (Holy Land MTN race, Africa, Baja Divide to Arizona Trail, etc.) Very durable and great for everyday use to month's long trip. I highly recommend the Revelate Design products. And this bag is perfect for the smaller rider who cannot utilize the larger version of this bag. Great seat pack for smaller cyclists with not a lot of exposed seat post. I bought the Pika due to space restrictions on my 16 Surly Ogre. I have a Revelate Terrapin that I use on other bikes, so I am no stranger to the quality that Revelate brings to the table. The pack is well made with quality fabric. While being considerably smaller than the Terrapin, it still fits a tent with rain fly, sleeping bag and pillow easily. I did not notice any of the sway attributed with larger rear seat packs. In fact, I hardly notice it back there at all! The only thing I would like to see added, would be some webbing at the 4 attatchment points on the top of the pack. I remedied this myself with a quick trip to the fabric store. Well use it with my light road bikes when I have to run into town to pick up small items. Love this product. I use it for self-supported endurance bike races ranging from 124 miles to 250 miles. Durable. Looks good. Holds a lot while being more compact than similar seat bags. When the bag is full, you may get some side-to-side sway, but if the bag is properly cinched down, the sway in minimal.